Kaelah and I thought it'd be fun to wear one of the many dresses we both own and see how each other styled it up! We picked this little H&M number, which reminds us both of sailboats, and this is how I wore it. 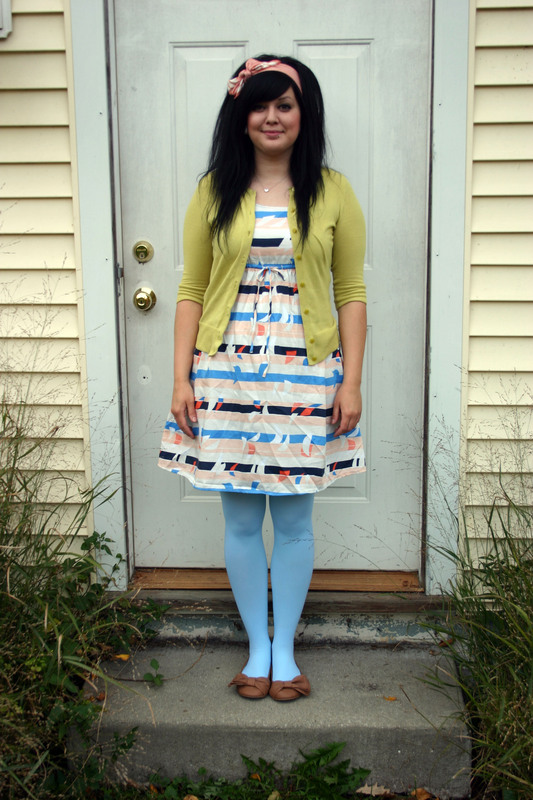 This is the first time I've worn these aqua tights from We Love Colors, mostly because I've been a little timid about how bright they are, but I really loved them with this outfit! Kaelah and I had a similar color scheme in mind! 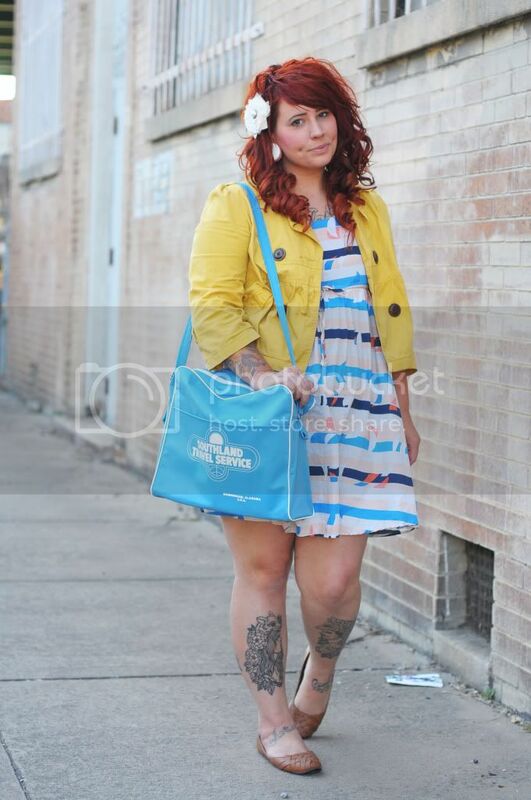 She wore it with a mustard yellow jacket, a sky blue bag, and the same color shoes as I did! Great minds think a like, huh?? Pop on over to her blog to check out more pictures of how she wore this dress! Chris and I have started watching Friday Night Lights on Netflix, and I am so so in love with it! I finished Felicity it record time, and needed a new show to get emotionally wrapped up in, and BONUS! Chris likes FNL too! I've been busily working on headbands, and I'm *thisclose* to getting my jewelry line up and running. Don't forget you can still get 15% off of everything in my Etsy shop, but hurry because the code expires tomorrow! I was so excited to see that you and KB have the same dress! I have one myself, but unfortunately it's waaaay too cold to wear it right now. Your outfit is ADORABLE!!! I love those tights. They are definitely lust worthy!!! As is that dress. You girls both styled your dresses gorgeously! I love the tights! Such a pretty colour. I love the color of the tights, I have a pale pink color from We Love Tights and am quite impressed with just how comfy they are. This dress is so cute and I love the way you styled it. What a wonderful idea! 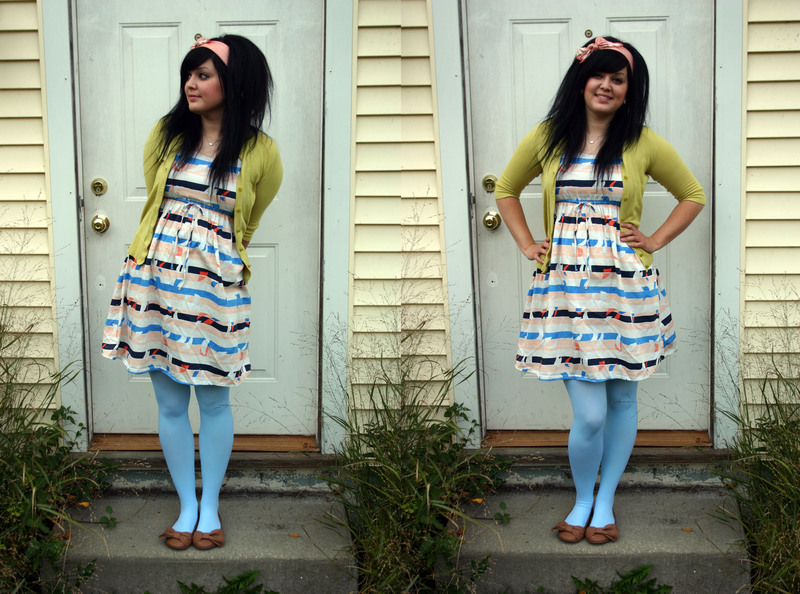 And that dress is completely adorable, and those tights look absolutely wonderful with it! I am so happy that it is now finally cool enough to wear tights without feeling like I am going to melt, hehe! Love the dress and tights! Super adorable! Gorgeous outfit! I've not been into h&m this month but I've just been paid and I'm going to search for that dress. I love how you've styled it! Very creative outfit. I really like the color combos.